This year, 2013, marks five hundred years since Spanish explorer Juan Ponce de Léon landed on Florida shores during Easter Week 1513, somewhere near Melbourne Beach. He claimed the land for the Spanish Crown, disregarding the Native Americans who already lived there, having descended from peoples who had arrived at least ten thousand years before. In his search for gold, Ponce de Léon found something far more valuable—a wealth of natural resources like nothing he’d ever seen. To European eyes, it looked like an untouched wilderness, a tropical Eden with four thousand native species of trees, shrubs, and other flowering plants quilting the flat landscape in texture and lush greens. Eye-catching wildflowers rippled through pine forests in rivulets of colors like pink, lavender, sky blue, and sun yellow. Their abundance, variety, and beauty so enchanted Ponce de Léon that he named it Florida—land of flowers. More than one hundred species of orchids grow here compared with only two species in Hawaii. Early travelers described the longleaf pine savanna spread over twenty million acres as “an airy grassland dotted with trees that created a cathedral-like atmosphere.” While longleaf pines dominated upland forests, a unique ecosystem called coastal scrub blanketed dunes along parts of the Gulf coast in thickets of stunted, salt-pruned sand oaks, magnolias, and sand pines mixed with lupines and false rosemary. “Water, water, everywhere” would have described Florida’s liquid assets. The state boasted seventy-eight hundred lakes, seventeen hundred rivers and streams, and more than six hundred sparkling freshwater springs, along with thirteen hundred miles of coastline bordering the Gulf and the Atlantic Ocean. This bounty of natural wonders attracted all types of wildlife, from birds and wild panthers and black bear to thousands of fish species, both fresh and saltwater. Where can one find all this glory now? Who could have envisioned that such a vast, seemingly inexhaustible wilderness would be so transformed in only a few centuries? Ponce de Léon would not recognize it today. He’d stare in disbelief at the endless vistas of high-rises, condos, resorts, and vacation homes that line its shores; restaurants, shopping malls, and theme parks have replaced all but 2 percent of its native longleaf pine forests. Luckily for all Floridians and millions of visitors today, the Florida Park Service was created in 1935 to preserve “the state’s original natural resources for all time, and make them accessible for public enjoyment.” Celebrate Viva La Florida 500—a statewide commemoration of Florida’s anniversary—at a state park. There are 171 to choose from, spread over a half-million acres of conservation land. Florida State Parks evolved from a federal program called the Civilian Conservation Corps (CCC), which provided conservation-related work programs for young men during the depression. To benefit from the CCC, the Florida legislature directed the Board of Forestry to survey for lands suitable for state parks. 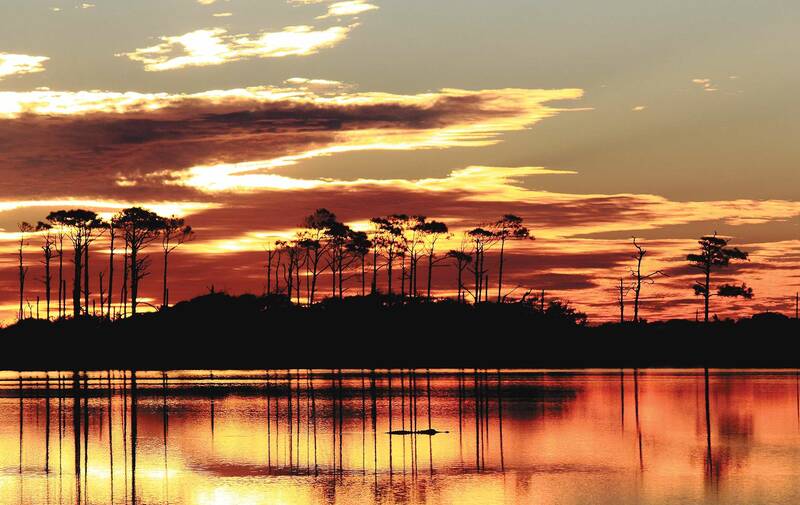 The Florida State Park System is one of the nation’s largest park systems, and it has twice been awarded the National Gold Medal for best parks. With an ongoing mission to provide resource-based recreation while preserving, interpreting, and restoring natural and cultural resources, the parks are the public’s best bet to see the Real Florida. For a rich sampling of Florida nature, people can explore three parks in the Northwest Florida Panhandle, one of the most biologically diverse regions in the state. All three can be accessed off Highway 30-A, a scenic corridor that runs along stunning beaches and connects the fourteen coastal communities called the Beaches of South Walton. More like a resort than the other two parks, Topsail balances visitor R & R with flora and fauna conservation. Trams and elevated boardwalks enable folks to get around without trampling fragile dunes and vegetation. The RV resort, campgrounds, and recreational facilities are located near the main entrance far from the secluded preserve section, so while a happy camper grills hamburgers outside his RV, our fine-feathered friends can scour vegetation for an outdoor picnic. Campbell Lake, one of the fifteen dune lakes, illustrates why this park has been christened “the Crown Jewel of the Emerald Coast.” The 1,640-acre park with sixteen distinct natural communities offers superlatives: the longest unbroken stretch of undeveloped beach in Walton County, the most cabins of any park in the state along with the largest dedicated tent site, and one of the tallest dunes in the state. Topsail Hill—the park’s namesake dune—towers nearly fifty feet above the Gulf, affording magnificent views of the wind-sculpted transitional zone between land and sea. From this high ridge, one sees the perfection of God’s creation: how everything is interconnected and interrelated as each natural community flows into the next in a seamless, harmonious design. Dunes sweep across the horizon, rising into hills and sloping into valleys called swales before flattening out into the broad beach, before disappearing underwater as the Gulf’s floor. Turning around and looking in the opposite direction, one can observe how the high ridge drops down to form a basin swamp filled with water-loving trees and vegetation like cypress. Farther out, the land rises again, changing into wet prairie, and finally, off in the distance, the rounded tops of a longleaf pine forest appear. It’s clear why we need state parks to protect these fragile landscapes, as nothing is here by accident, but every plant and animal is essential for the healthy functioning of the whole. Ripping out vegetation like sea oats would make the primary dunes blow away, leading to coastal erosion and making us vulnerable to winds and storm surges while depriving the Choctawhatchee beach mouse of its food source. If too many shorebird eggs get trampled beneath the sand, the survival of an entire species is threatened. Topsail rangers have noticed a difference in shorebird restoration since they roped off large beach sections for safe nesting sites. “We’ve had a huge comeback in shorebird populations like snowy plovers and least terns nesting in the dunes,” explains park manager Jason Cutshaw. Birds are not the only creatures that hide out in these protected dunes. Growing among the laurel oaks, primrose, and false rosemary clumps is a spindly plant with a significant role called honeycomb head. It’s the host flower for the solitary bee, endemic to only a half-mile strip along Gulf Coast dunes from Alabama to Florida. “Before this area was developed, it looked a lot like this,” Talbert explains, gesturing toward a wet prairie surrounded by old-growth longleaf pines. “A sea of longleaf pine grassland spread over most the state. Today, only a few remnants like this remain. With trees spaced far apart, sunshine streams down on grasses and wildflowers. Before fire suppression, lightning strikes ignited fires that pruned away the excess vegetation and kept it open. Today we mimic nature and use prescribed burns for the same results.” Talbert points out an old-growth tree with a thick trunk and flattened top he says is around two hundred years old. Wet prairies, basin swamps, and cypress domes mix in with pines to furnish habitat for carnivorous pitcher plants, sundews, and rare orchids. Wet prairies are an important source of fresh water for dune lakes, as rainwater spills off their saturated surfaces into the lakes. Grayton Beach State Park provides a quiet interlude between bustling Seaside and laid-back Grayton Beach, one of the oldest beach towns skirting the Gulf. Here, one can slip back to when Native Americans fished the Gulf, deer foraged the dunes, and black bear and bobcat roamed inland forests. Like its neighboring communities, the park is user friendly, so attractions are accessible and exploring is easy. Park visitors can hike a coastal trail directly off the parking lot, or take the boardwalk down to a pristine beach for walking, swimming, or fishing the Gulf. Recreational options include paddling a nearby dune lake or crossing Highway 30-A to hike a nature trail through inland forest. They can do all this in a relaxed, unhurried way, allowing nature to work its magic—transforming them into naturalists who will forever love wild places. Native wildflower plantings—a recent restoration project—greet visitors at the main park entrance. Wildflowers still dazzle us with their bright colors and delicate beauty. More than just a pretty face, however, wildflowers work overtime enriching the soil, preventing erosion, and providing habitat for countless insects like dragonflies, pollinating honeybees, and butterflies, and other small creatures like birds. Monarch butterflies even synchronize their arrival and reproduction with the milkweed’s growing season. Wildflowers’ vivid colors act like beacons, flagging down monarchs for refueling stops essential for completing their grueling two-thousand-mile journey to Mexico. These were all good reasons for park manager Dale Shingler to start a wildflower restoration project after a local resident bemoaned the loss of area wildflowers. “We remember masses of golden wildflowers blooming along 30-A and want to bring them back,” he shared with Choctawhatchee Basin Alliance and AmeriCorps volunteers who helped plant. Current park manager Matthew Allen, who replaced Shingler when he retired, will continue planting every season until once again wildflowers flourish along park boundaries. It is to be hoped that all this flower power will persuade county officials to change mowing practices that eliminate wildflowers by using low-blade settings and mowing before flowers have reseeded. A wet prairie restoration project aids in wildflower preservation as certain wildflower species also depend on fire, especially pitcher plants, one of the oldest flowering plants on earth, having survived since dinosaurs roamed. “Once we cleared out encroaching titi, our herb biologist discovered endangered plants like the white-fringed orchid, which we had never seen,” exclaims Allen. At first glance, a burned forest appears desolate and lifeless, with scorched tree trunks and blackened earth. However, a closer inspection reveals new life resurrecting from the ashes. Intense sunlight coaxes up carnivorous plants like the pink sundew; with rosy leaves radiating from the center, it resembles a tiny starfish. The leaves glisten with what looks like dew but is actually a gummy substance that traps insects. Yellow pitcher plants trap insects in furled leaves that would fill up with rainwater without their protective built-in umbrella. Perhaps Ponce de Léon did discover the fountain of youth. For learning about nature and engaging with it does awaken childlike qualities like awe, wonder, curiosity, and adventure—all instrumental in keeping us forever young. Without the cabins or camping facilities of the other two parks, Deer Lake offers sanctuary for humans and wildlife alike. The spectacular vista from the long boardwalk suggests a place of quiet retreat. A dune ecosystem—one of the park’s eleven natural communities—rolls out in endless waves to the sea, just as it has done for thousands of years. It forms a timeless picture of the way this entire region once looked. Sculpted by wind into smooth, rounded hills and hollowed-out depressions—all protected by the boardwalk—the scene appears untrammeled except by natural elements. The slithering line of a snake is etched upon the sand as precise and bold as a pen-and-ink drawing on white paper, as is the indented hoof mark of a deer, or a raccoon’s delicate paw print. Rare plants like the showy Gulf Coast lupine, spoonflower, golden asters, and clumps of rosemary anchor the sand at intervals. The impenetrable thicket of coastal scrub blanketing the dunes in dark green grows only in Northwest Florida from Ochlockonee Bay west to Destin. Free of chairs, umbrellas, and other beach gear, it’s the kind of solitary place a female sea turtle searches for. An empty beach glowing like a pearl on a moonlit night beckons her ashore for the ancient ritual of species preservation. The Choctawhatchee beach mouse, another endangered species, scurries around at night nibbling on sea oat seeds. Shorebirds like snowy plovers favor these beaches as undisturbed nesting sites for laying tiny eggs in shallow depressions. Continuing down the boardwalk onto the expansive beach, one can discover what deserted beaches and Gulf waters do for humans. Unplugged from electronic devices, senses tune in and come alive to the therapeutic effects of nature. Sunshine warms and relaxes the body; the meditative sound of lapping water quiets the mind, and energy surges as swimming or walking releases endorphins—all creating a sense of well-being. Like migratory birds, people can find here a respite in life’s journey, a place where they can take it easy and reflect, rediscovering the peace and harmony of the natural world. After reveling in nature, visitors to Florida’s parks might concede Ponce de Léon did indeed find gold, although not in the glittering form he expected, for no other factor has contributed to the prosperity and allure of Florida like its wealth of natural resources. They sustained early inhabitants and continue to draw millions to live and vacation here, making it the third largest state in the nation. Fortunately, some wise people realized this priceless resource could be destroyed by future waves of development, rolling over it with the relentless ferocity of a hurricane storm surge. Spending time in these parks, learning more about the interconnectedness of nature, seeing the artistry of God in a butterfly’s wing, one awakens to how priceless something is that cannot be manufactured or duplicated. Now, thanks to our parks, future generations will get a look at Ponce de Léon’s paradise—the real Florida. Have you ever wondered what Florida looked like over five centuries ago? Come see for yourself with a visit to a Florida State Park. The goal of the Florida Park Service is to restore these parks back to their condition prior to European discovery. For information on any of these Florida State Parks, please call (850) 267-8330 or visit www.FloridaStateParks.org.